Yacht Brokers rejoice with a successful Yacht Show! : Atlantic Yacht & Ship, Inc.
Yacht Brokers rejoice with a successful Yacht Show! 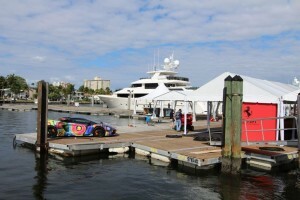 As they do every year with the conclusion of the Fort Lauderdale International Boat Show, horns from the $4 billion worth of yachts for sale blasted as yacht brokers celebrated a very successful show. There are several deals that yacht brokers at Atlantic Yacht & Ship are working on as a result of the show, and as always, more are sure to come as a result of this show. Guests from around the world came in for what was the busiest show we have seen in several years. Spirits were high and the docks were full thanks to a combination of beautiful inventory and enjoyable Florida weather. 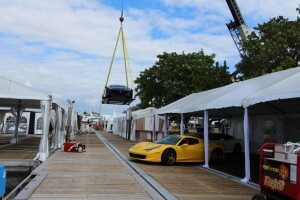 But what people don’t always think about is what happens behind the scenes to pull off such a massive yacht show. Aside from the extensive planning that happens months before the show in terms of what yachts will be in the show and how the show will be laid out, the physical set up of the show is equally impressive. About three weeks before the show opens, pilings are being pounded into the sea bed and the temporary floating docks are beginning to pile up. After the show boats start leaving immediately and everything will be back to normal about a week later. We snapped some pictures of the breakdown of our set up which are shown in this blog. For more information on the show or yachts for sale be sure to contact one of the professional yacht brokers at Atlantic Yacht & Ship. For over 53 years Atlantic Yacht & Ship has been serving the yachting community. Our headquarter sales office is dockside at Harbour Towne Marina in the heart of the yachting capital of the world, Fort Lauderdale, FL. Our in-house waterside service department provides general yacht services from new teak, to engine rebuilds, captain services, and everything in between. Whether purchasing or marketing a quality vessel, Atlantic Yacht and Ship, Inc. is your one stop resource for the highest quality service and sales in the yachting industry today. If you are looking at yachts for sale, or thinking about selling your yacht, it is always wise to have an experienced broker representing your interests throughout the deal. Contact Atlantic Yacht & Ship at 954.921.1500 or click here. What a successful boat show for used motor yachts for sale!